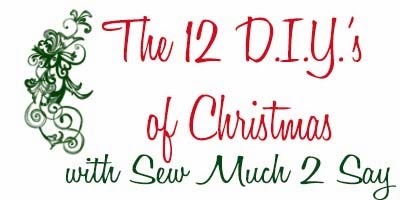 We are quickly approaching Christmas and I still have a few more Christmas DIY's to share. If you don't have time to make these this year just pin the photo and come back before Christmas next year! This is (another) ornament. It is easy to make and really doesn't take much time at all. Trust me, it looks harder to make than it actually is. Pick your paper colors. I decided on red and gold because they are Christmas-y colors. This would look great in silvers or blues, too. Glue your two sheets of paper together so it looks like you have one double sided piece of paper. Let it dry. Then, cut your piece of paper into four 6x6 pieces. 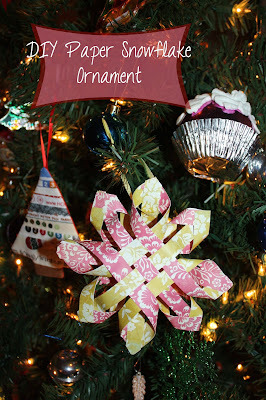 Each ornament will be made from one 6x6 paper, so you will have enough to make four ornaments. Cut your 6x6 into 1/2 inch strips. You will end up with 12 total. I used my rotary cutter, but you can use scissors and trace 1/2" with a ruler. Cross two strips directly in the center of each strip. You want to have the strips laying so that one direction is one color and the other direction shows the second color, as shown. Weave them together like so. Add a tiny bit of glue at each intersection. You will end up using 6 strips for each woven set. Make another one with the other 6 strips from your 6x6 block. Let them dry. Fold the corners as shown and make sure to twist upward, so that your point will be higher than the rest of the paper. Put a dab of glue there to hold it together and secure with a paper clip or binder clip until it dries. Repeat with every corner on both woven sets. You should have 8 corners secured and drying. Make sure to leave the center strip free. This is what they will look like when dry. Take one woven set and flip it "bottom" side up, so that the flat part is up and the twisted corners are facing down. Place the "bottom" side up half on top of the other half so that the middle strips from the bottom half line up with the points of the top half. I know this sounds confusing. I tried to show a corner matching up with a straight strip in the photo above. It looks like this from the side. Then, tuck the strips through each "point" so that the ends of the strips match up with the points. This will cause your snow flake to bow a little, which is good. Match up the ends, glue, and secure until it dries. When it dries, trim the straight strips so that they match the points. Add a string and hang it on the tree. Ornaments are so great to make because they work up quickly and look pretty on the top of gifts if you decide to give them to your loved ones. Recipe Writers: Christmas Cookie Link Up!